The goal of an escalation league is to gather new players, train existing players, and have fun while building up tournament-level armies. Events will occur weekly, with an ascending point level, giving players time to build, paint, and plan their core force. Warhammer 40,000 8th Edition is a large departure from previous version of Warhammer 40,000. This section will define some key terms as they relate to the 8th edition of the game. There are three current ways to play Warhammer 40K—Open play, Narrative Play, and Matched Play. Open Play and Narrative Play games allow more flexibility in list building and allow armies to be built that are not battle-forged. Matched Play games require the army to be battle-forged—that is, all models in the army must be organized into detachments sharing a faction keyword. Battle-forged armies can have one or more detachments in an army. A detachment is a method of organizing models in an army. All models in a detachment must share a faction keyword. Detachments may offer command points for complying with the rules of organization depending on the size of the detachment in question. The Force Organization Chart, or FOC, defines the battlefield role of a unit in a detachment. The current battlefield roles are: HQ, Troops, Elites, Fast Attack, Heavy Support, Dedicated Transport, Flyer, Fortification, and Lord of War. A unit’s datasheet will define its battlefield role. All unit rules and statistics are detailed on the unit’s datasheet. Datasheets can be found in an army’s Codex book or one of the five Index books (Index Imperium 1, Index Imperium 2, Index Chaos, Index Xenos 1, and Index Xenos 2). These books may be purchased at The Relentless Dragon. Primary league day is Saturday with play from 12:00pm until 6:00pm. Secondary league day is Sunday with play from 12:00pm until 6:00pm. Players can organize additional matches with opponents for any day of the week, space permitting. Please call ahead (603-204-5275) to ensure space will be available. Friday nights are not good! Every week matches will be played at a given point level. Point levels will increase every two weeks, giving players plenty of opportunity to acquire and paint new models. This league will be played under the 8th edition rule set of Warhammer 40K. Players should be using unit statistics and compositions from their army’s codex or Index, as applicable. Unit point costs should use the most recent available source (e.g. Chapter Approved 2017). Armies should be built using points, rather than power levels. Command Points for detachments as detailed in the rulebook are conferred during this season. Patrol Detachments do not offer additional CP—players will be limited to the 3 CP granted from being battle-forged. 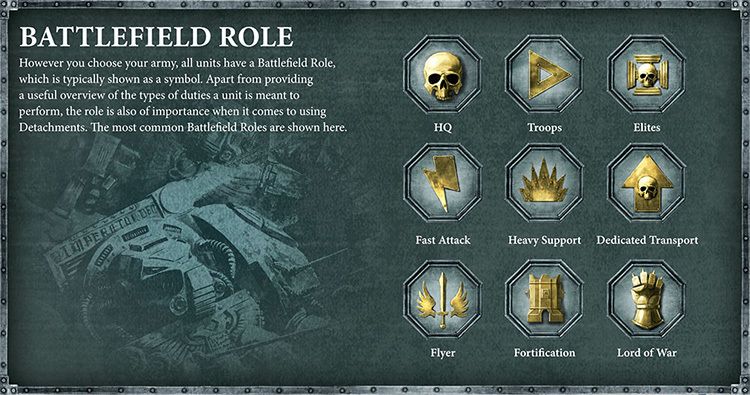 Battalion Detachments offer 3 CP, in addition to the 3CP granted from being battle-forged, for a total of 6 CP. All units in your army must share a faction keyword (e.g. Orks, Tyranids, Eldar, Dark Eldar, Space Marines, Grey Knights, Imperial Knights, Chaos Space Marines, Tau, Necrons, Astra Militarum, etc.) and must follow all build restrictions based on your chosen faction keyword. Players are encouraged (but not required) to play the same army (“faction”) throughout the entire league, adding to it as they go. If you play the same army throughout the entire league, you will be awarded a one-time bonus of 5 League Points at the close of the league. Players are encouraged to try out different lists and builds within their army from week-to-week. This is an opportunity to try out new units and tactics. There are no items, units, abilities, or powers that are banned. However, players are encouraged to build fun lists and not “min/max” type lists designed for competitive tournaments. We reserve the right to ban items, units, abilities, or powers as the league progresses if they seriously hamper the fun nature of the league. Players that are found to be disrupting the fun, casual aspect of the league may be asked to change their army list or cease future participation. Models should be WYSIWIG (What You See Is What You Get) as much as possible. “Primary” weapons should not be “proxied”—e.g. if your list specifies a marine with a melta gun, the model should depict a melta gun and not use something else as a stand-in. It is not necessary to model every minor item or secondary weapon on a figure—for example, nearly all orks are armed with Stikkbombs, so it is not necessary (nor reasonable) for figures to have stikkbombs on them. Any WYSIWIG deviations should be pointed out to your opponent prior to your battle. As not everyone may be familiar with the weaponry of other factions, players should point out to their opponents what weapons are carried by their models. Battles will be organized and fought according to the rules in the core rulebook or Chapter Approved 2017, based on mutual agreement of both players. Players should randomly determine the mission being fought, and the deployment method. Weeks 1 through 6 should only utilize the Eternal War missions. All other rules of the mission being fought will be utilized, including secondary objectives, etc. Missions should be played utilizing Matched Play rules. Beta rules are not used in this league. When keeping track of wounds, players are encouraged to count down, rather than up. During the duration of the escalation league, players can play up to three league games per week. The first game you play each week awards you a number of league points based on the degree of your victory as outlined below. At the end of each game, players total their victory points. The player who scores the most points wins, while the other player losses. If both players score the same points, the game is a draw. If the winning player scores twice (or more) the victory points over the losing player, then the winning player scores a Crushing Victory. The degree of victory determines how many league points a player earns per game as detailed in the table above. The following two games each week award you 3 additional league points for a crushing victory, 2 additional league points for a win, 1 additional league point for a draw, and 0 additional points for a loss. Additional games should be organized directly between players and can be played any time during that week. Additional games should be played against different opponents where possible. Players should not play more than 2 official league games per opponent, per week. Players can earn an additional 3 League Points per game, per week based on sportsmanship. After each game score your opponent’s sportsmanship by marking the appropriate ‘yes’ or ‘no’ check boxes on the scoring sheet. A player earns 1 point per ‘yes’ they receive. Was your opponent prepared and brought all the materials they needed to play, including a detailed army list for you to refer to during the game? Was your opponent on time and managed their turns and time well while playing? Was your opponent fun to play against and did they resolve disputes fairly? Players can earn up to a total of 5 League Points each week for painting and basing their armies. See the next section for painting guidelines. While there is no requirement to paint your models, the purpose of the escalation league is to encourage players to build and paint their armies over time. As can be seen above, the points for a fully painted and based army can equal a crushing victory each week! The purpose of the escalation league however, is not to judge a player’s skill or ability to paint. At a minimum, models should be painted to a basic tabletop standard. This standard is generally considered to be 3 colors minimum, not including primer. Colors can include shading and highlighting, but this is not necessary. Bases should be finished with sand, gravel, texture paint, grass, or other appropriate basing materials, with none of the plastic base showing (other than base rims). To earn the point for unified basing, all bases across the entire army should be finished in a similar fashion using similar materials, colors, and base rim colors. Bases do not need to be identical (nor should they), but should show a common theme or style. It is acceptable and encouraged to have more elaborate basing for character models to show off their uniqueness in the army. Players are encouraged to bring any other materials appropriate to their army that they may own such as Psychic Power cards, Stratagem cards, etc. Please be sure to bring all of these materials that you need to play each week—in most cases, the store cannot loan materials to players. Players are expected to pay the initial registration fee at the start of week 1, and then the additional point increase fee at the start of weeks 3 and 5. Prizes will be awarded in the form of store credit at The Relentless Dragon. Total awards will be determined at league end as determined by each player’s total league points. Special awards for best army and best sportsmanship may be awarded as well, at the discretion of staff.